BABY TEETH: More important than you think ! Many people think baby teeth aren't important because they'll eventually fall out, but this could not be further from the truth. Parents need to be aware that baby teeth (also called primary teeth) are important because they help ensure normal jaw growth and save space for when permanent teeth come in. 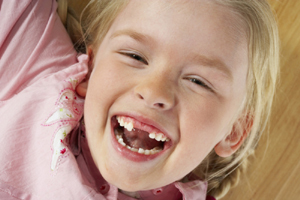 Primary teeth also have a lot to do with overall growth and development. That's why it's important for parents to bring their child to the dentist between their first and second birthday. Three or four or five is too late for a first dental visit, and some oral health problems can be quite far along by then. An early start also gives us a chance to educate the parents and work on important things like diet, oral hygiene and fluoride usage.